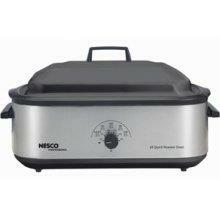 Nesco Roaster Oven 18-qt. Nonstick - Enjoy oven-quality food with the convenience of a slow cooker, plus portability! This 18-qt. roaster oven roasts, bakes, steams and slow cooks, then goes right to the table thanks to its own serving container. Roomy enough for a 22-lb. turkey, it has auto temperature control up to 450 degrees and features Circle of Heat Technology, a wraparound heating element that ensures moist, even results. The high-domed, self-basting cover frees-up your time to do other tasks as it provides perfectly cooked, tender poultry and meat. * Please call us for any questions on our 18 qt roaster oven silver in Tyler, serving Longview, Palestine, Athens, White Oak, Shreveport LA in East Texas and Western Louisiana.